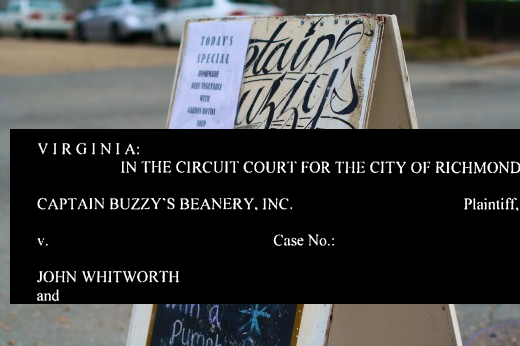 Weird day on Broad Street… In further Captain Buzzy’s news: I have been told that the lawsuit filed against the Church Hill Association and several individuals last December was “dismissed with prejudice” this morning. As you know, we at CHA have been silent while this matter was proceeding. I want you to know that the CHA Board reviewed the allegations and evidence in detail, and assessed that the suit had no merit, and that the allegations were not true. We are grateful that the legal process has brought this to a just end. We will continue our mission of making our community the best it can be. I don’t know the details of the case that was brought against CHA (sounds like it must have been pretty weak), but I will say that I like Captain Buzzy’s and thought it was very weird that it was blocked from serving wine and mimosas when The Hill Cafe (which I also like) is home to a lively bar scene that is literally a stone’s throw away. Has anyone ever claimed responsibility for the anti-Buzzy’s ads that were run, presumably showing hooch being poured into a coffee mug? …I believe there is a plate of “words” that’s calling your name – chow time, big guy. Kai, The answer to your question is a matter of public record at the John Marshall Courts building along with a “secret” settlement agreement. As for G, and Mr. Cooper, the Defendants NEVER denied doing what they were accused of, they claimed they were,” excersizing their right to free speech”. and used the, Hoerr-Pennington Doctrine as their defense. I hope the issue will be resolved to the benefit of the nighborhood. It took way too long but finally truth and justice, for those accused, has been realized. Now let’s see how long it will be for those, so quick to cast stones, are willing to admit their complicity in the matter by being negative, quick to judge and condemning – without all the facts. Lesson learned here for our emerging community…just because somebody puts something on internet/sites does not mean it is truthful, balanced or fair. In the future, let us be more civil, less judgmental and get the facts before jumping on the loudest, critical and garish band-wagon. I would really, really, really love to not rehash all of this, and am going to shut this one down early.